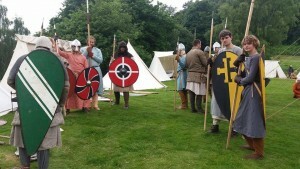 This blog was written by Lewis Calvert-Lee, one of our Medieval Studies students, recently took part in the reenactment of the siege at Beeston castle. 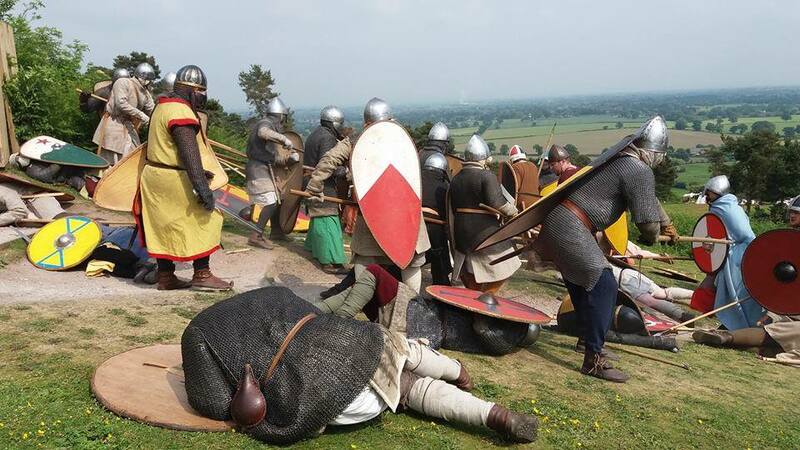 ‘This weekend (4th – 5th June) I was at Beeston Castle taking part in a siege. 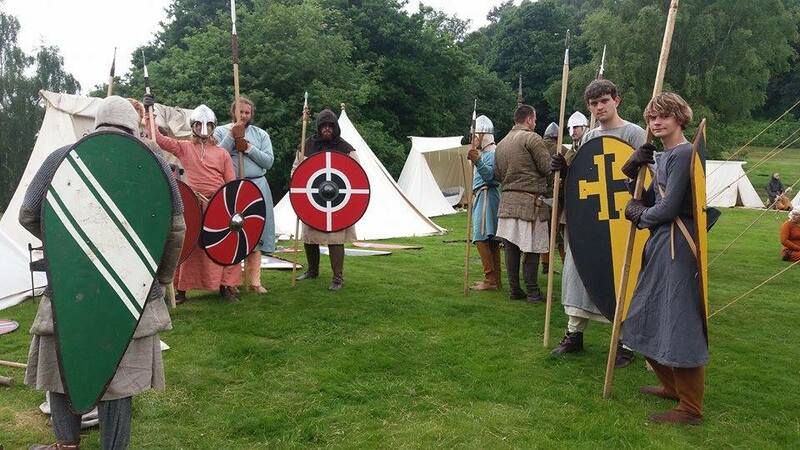 The re-enactment group present was Historia Normannis (a medieval re-enactment group that portrays the period from 1066-1215). Assaulting the Keep, Lewis had been ‘killed’ at this point and his feet can be seen bottom right. Photo courtesy of Dave Pilling. The brother of a powerful Welsh Prince had been kidnapped by the Castellan of Beeston and Prince Rhys had summoned an army to rescue him. The Castellan was hosting a tournament in celebration of his victory, when the Welsh army arrived and stormed the outer-gates. 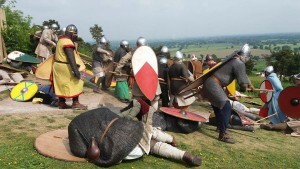 The English drew back to the Gatehouse and successfully defended the castle until the Welsh threw fire onto the English forcing them to retreat further into the Castle. Finally the English made a valiant last stand at the keep surviving wave upon wave of Welsh attackers until they were relieved to see that the Earl of Chester had sent a relief column to their aid. With the Welsh forces surrounded, the Prince was captured and “re-united” with his brother in the castle dungeons. Lewis (Centre) and other Welsh tribesmen. Photo courtesy of Dave Pilling. I was portraying a Welsh tribesman (with the “target shield”) and through the blistering heat was forced to assault the castle leading to my eventual demise at the point of a spear. The event was amazing with pyrotechnics and siege engines being used to great effect, the weather was scorching and made me thankful I didn’t have to climb the hill in chainmail, like many of the lords and knights had to. If anyone is interested in joining Historia Normannis, we have a Lampeter branch that can be found on Facebook. Historia Normanis Lampeter Facebook group: Join up!